William Fox has been appointed Sub Organist from July 2018. James Orford has been appointed William and Irene Miller Organ Scholar from January 2018. Nicholas Freestone has been appointed Acting Sub Organist from January-July 2018. William Fox is currently the Organ Scholar of Magdalen College, Oxford, where he is completing an undergraduate degree in Music. Before going to Oxford, he held Organ Scholarships at Hereford Cathedral for his gap year, and at Wells Cathedral for the duration of his sixth-form, also holding a Government-funded Music Scholarship at the Specialist Music School there. William was such a strong candidate that it was felt worth waiting until the summer in order for him to fill the position. James Orford is currently in his third year of undergraduate study at the Royal Academy of Music. He has won numerous scholarships, organ prizes and piano accompaniment prizes whilst at the RAM, and has performed Schumann’s Piano Concerto at Cadogan Hall. 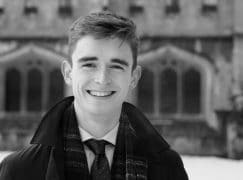 In addition to his studies, James is currently Organ Scholar at King’s College, London, a position that he will be able to hold concurrently with his duties at St Paul’s until the end of this academic year. Nicholas Freestone is the current William and Irene Miller Organ Scholar of St Paul’s Cathedral. As an experienced colleague, it was a natural fit for Nicholas to hold the position of Acting Sub Organist until the arrival of William Fox in July 2018. Nicholas joined the Cathedral following two years at St Albans Cathedral, having previously held scholarships at Wells Cathedral and Tewkesbury Abbey. St Paul’s has had female Organ scholars in the past- most notably Rachel Mahon. They were also one of the first Cathedrals to admit female altos into the choir and have permenant contralto singers; they are doing great things in Cathedral music. Exactly, other than there are none coming through the colleges as they know there aren’t any jobs worth talking about at the end of it in any British cathedral for them – don’t know about Continental Europe or anywhere else! Actually – they’ve already had a very good one indeed! Her name was Rachel Mahon. I was just asking. Not everyone need ask questions to which they already know the answers. And what about the English choral scene generally? Oh do leave off. I get enough Islamophobic crap in my Facebook feed as it is. There’s no need for it in a classical music blog. If you rely on Farcebook for anything more than fake news and cheap entertainment, then you are beyond help! Not another American expert on how London is! There is no need for ignorant, racist rubbish anywhere. Shame on you Mutton. Shame on Mutton and thank you, Elizabeth Owen. E.F. Mutton has quoted a very simple statistic, without interpretation. If it is so (and that I do not know) then it is so, however it may be interpreted. Whether it is relevant to the item, well that’s another question. But racism? You say he doesn ‘t interpret and yet he uses the despicable and pathetic name Londonistan? By even bringing it up he is implying that somehow Muslims are responsible for opening many mosques and ignoring the fact that people are not attending churches as they used to. Maybe because they don’t believe but also the church does not have as many people becoming ministers so parishes are being amalgamated and priests are being asked to look after four or five at a time. Nothing to do with talented young men becoming organists at St Paul’s cathedral and certainly nothing to do with the number of mosques in London. Thank you, Elizabeth and well said. No, we don’t need this, and not on here. The thread was about the appointment of three new organists at St Paul’s Cathedral, and perhaps a mention that women again seem to be lacking as organists – not this Islamaphobic nonsense from yet another armchair expert from America! Islam isn’t a race. It’s a religion that is manifestly superseding Christianity in London. And designating an objective assessment as a “phobia” (definition: an i r r a t i o n a l aversion) and facts as “ignorant rubbish” demonstrates only your own intellectual bankruptcy. Are you seriously suggesting that this study by the Gatestone Institute is an objective assessment? And your asertion that Islam is “manifestly superseding Christianity in London” is utter nonsense. And by the way, congratulations to all three of them. You couldn’t get nicer and more enlightening musically than than Andrew Carwood to work with as the director of music at St Paul’s – a singer! The whole Anglican cathedral music tradition is still inescapably male at the level of organist and director of music. I can think of only one female Cathedral organist, Hazel Gedge, formerly at Brecon Cathedral. Interesting that there have been female concert organists, for example Jennifer Bate, Gillian Weir, Jane Parker-Smith, Jane Watts and Catherine Ennis. Maybe none of them even wanted to get caught up in the predominantly male networks of Cathedral music. I have no desire to disagree with this very accurate comment, but I would add to this short list Katherine Dienes-Williams at Guildford Cathedral, Sarah Baldock until recently at Chichester Cathedral, Elizabeth Stratford at Arundel (Catholic) Cathedral, and Cathy Lamb at Lichfield Cathedral. Elsewhere, Francesca Massey is Sub-Organist at Durham Cathedral, Claire Innes-Hopkins is Assistant Organist at Rochester Cathedral and, pertinent to this thread, Rachel Mahon (previously Organ Scholar at St Paul’s Cathedral) is Assistant Organist at Chester Cathedral. Glad to see that there are more than I knew about. Thank you. Thanks for the informative answer! More perhaps than I thought, but still a small number. I mean: it is some years since most cathedrals admitted girls to their choirs, or set up mixed choirs alongside the male choirs. Not that that necessarily helps with the organist/music director point, but one might have thought there might have been a bit more change as a result. our amazing Musical Director is leaving the parish and we would like him to have the honour of playing the organ at St Pauls. His name is Graham Kidd and he has done so much for choirs and orchestras in West End Southampton over the years. Could you please tell us what we can do to make this happen for our very talented special friend. ALL my favourite choirs are mixed but is everyone happy to see the all male choir tradition become extinct within 20 years (probably)? The envy of the world, cultural heritage, authentic performance practice, future countertenors, tenors and basses…..? More girls choirs – brilliant!